I was originally introduced to Katie Termini through our mutual friend/her childhood best friend, Jessie Rudin, who is, if you can believe it, another strikingly beautiful mega-mom, style maven, and surf lover. 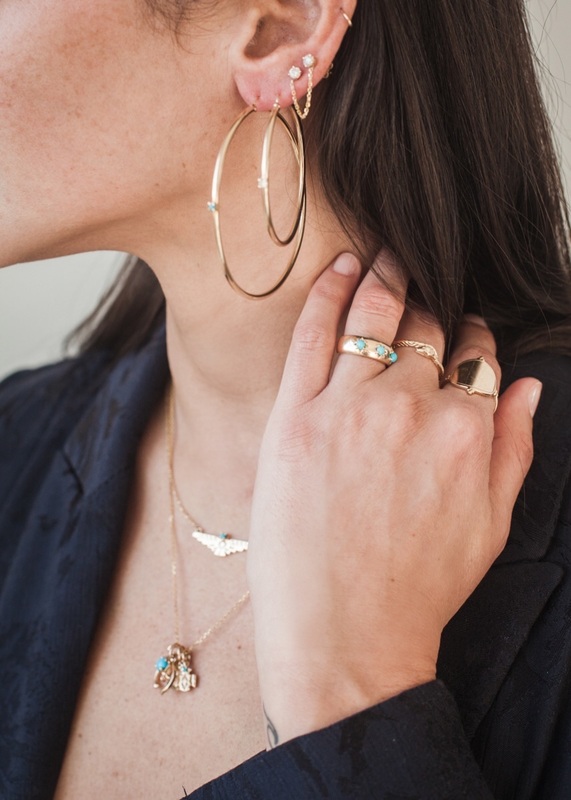 When I first met Katie, I immediately noticed her minimal yet super cool tattoos of ocean waves and to me, she was the definition of a chic boho surfer girl who designs the most amazing jewelry through her own line, Fayt. However, all my assumptions were quickly trumped by the reality that this woman was even more amazing than I thought. We sat down with this awesome woman to hear more about how she maintains a healthy work/life balance and why her line of Fayt is the perfect creative outlet. Read more about this force of nature below! 1. What is your background: Where did you grow up... style influences (now and then)? I grew up in NYC and NJ, so the street style of NYC has always been a big part of my life and inspiration. My mom worked in fashion so she always had incredible pieces and great style. I also always loved Ali McGraw and Jane Birkin, classic beauties with an edge. 2. What is your inspiration for pursuing your creative/artistic side? My primary career is as a forensic neuropsychologist, so I spend much of my day meeting with people who have committed heinous crimes. That work can be emotionally draining so when I started working on Fayt Jewelry, I found that having a creative outlet really helped balance my life and allowed me to put my energy into something emotionally uplifting. 3. What was your mentality behind starting your own jewelry line? How did you decide to start FAYT? When I got engaged, I had something in mind for my wedding band, but could not find exactly what I wanted anywhere. Through my husband I was introduced to Mark Awad, who is now my partner. He was able to make the exact ring I wanted and we were so happy with the design that we just kept making things and Fayt Jewelry was born! It was a very organic process and something that I never really planned to do, but has become such a labor of love. 4. What do you hope it brings consumers? The greatest compliment a customer can give me is to tell me that they never take a piece of our jewelry off. For Fayt, I try to design fine jewelry pieces that can be worn every day: to work, an evening out, or hanging on the beach with friends. We make pieces that are special and unique, but also effortless and can be worn and mixed with anything. I hope to make getting dressed a little easier for our customers by having a special piece they can wear with anything! 5. Biggest accomplishment/revelation during the process? I think just getting the company off the ground was a huge accomplishment! As a doctor, I knew little to nothing about the jewelry business, so getting started was a very steep learning curve. But I thrive on learning new things, so it’s been exciting to be able to learn as I go and take on an entirely different industry. My biggest revelation has been seeing the change in the market over just the past five years. Social media has entirely taken over marketing/advertising and even the sales side of the industry as well. It is changing and updating constantly, in a business where for decades the model remained unchanged. 6. What do you love about living in New York and how does it inspire you? New York is such a melting pot of style and no two people have the same style or dress alike, which is a constant inspiration. You could see five people wearing the same item of clothing and it would look completely different on each of them depending on how they style it. Seeing the different ways people interpret fashion keeps me on my creative edge. 7. Dreams for the future? Of course I would love to see the business grow and thrive, but I don’t necessarily have any specific goals in mind. Since the beginning I have kind of let the business grow on its own and just seen where it takes me, so I will continue to do that and take hold of any opportunity that comes my way for Fayt. My daughter is 2 years old, so as she gets older I do want her to see how hard mommy works running two businesses and that her goals and dreams should never be limited or put in a box.